In the modern day we see many of the emerging economies of the world moving forward with high growth while in contrast many of the mature western economies have anaemic growth at best. This was reinforced last week with the UK reporting preliminary quarterly growth of 0.3% (1.3% annualised) while the US fared better with an annualised 2.5%. In contrast on the 15 April 2013 we heard that China was growing at 7.7%. Does this mean we should all be selling our mature market equities and loading up on emerging markets? Or do we get enough benefit from the fact that many mature market companies are exposed to high growth markets? As a private investor are we really going to put a significant portion of our wealth into the Venezuela stock market? Or the Turkish XU100, Egyptian EGX, Pakistan KSE or the Kenya NSE for that matter? Well as somebody who is searching for consistent return over many years I know I’m not. 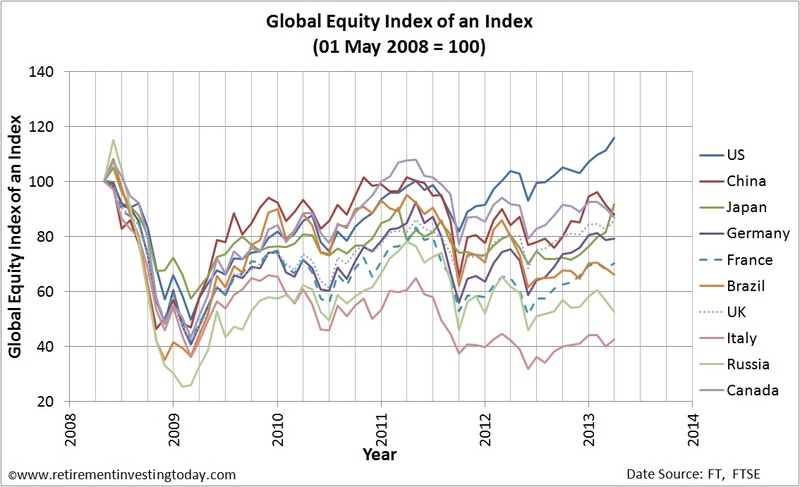 The majority of results simply show the performance of the major stock market within each country. This is flawed because each of these markets is priced in the local currency of each country and we all know that currencies move for all manner of reasons including varying rates of currency devaluation caused by inflation. You therefore cannot compare one with the other as they have different units. It would be like saying Car A which is travelling at 110 km/hour is going faster than Car B which is travelling at 100 miles/hour. A clearly ludicrous statement. As the results only use the major stock market for each country they are only looking at the capital gain of each of these markets. If we truly want to understand the best performing market then we should also consider the contribution from dividends because dividends matter. Let’s therefore answer the question from a personal long term investor perspective while considering the three points above. Firstly to keep the analysis manageable I’m going to only compare the top 10 countries by GDP. This might be considered a little limiting but I feel it will be sufficient to answer the question as it includes 3 BRIC countries (Brazil, Russia, China) plenty of well known developed economies including the United States, Japan, Germany, France, Italy and Canada as well as a likely very important economy for many of us, the good old United Kingdom. Now that we have our countries we next need to remove the effect of currency fluctuations. To do this we need to price all these markets in a common currency. It doesn’t matter what currency we choose as long as it is the same for all countries. Luckily there is a dataset out there which does exactly this by pricing each countries index in US Dollars. 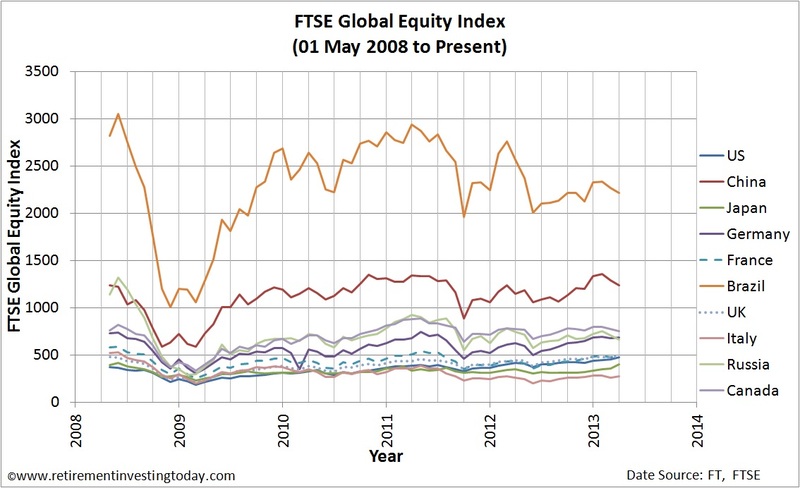 It’s called the FTSE Global Equity Index Series and is shown in the chart below. Unfortunately the raw data doesn’t really help us understand how each of the countries is performing relative to each other. Let’s therefore create an Index of an Index to enable us to compare apples with apples. This is shown below. Now we’re getting somewhere. This shows that over the past 5 years the best performing market has been the United States (and not one of the Emerging Markets) with a compound annual growth rate (CAGR) or annualised return of 3.0%. The worst performer of this group has been Italy with a CAGR of -15.7%. This includes two of the three points above but we’re still missing the contribution that dividends make. 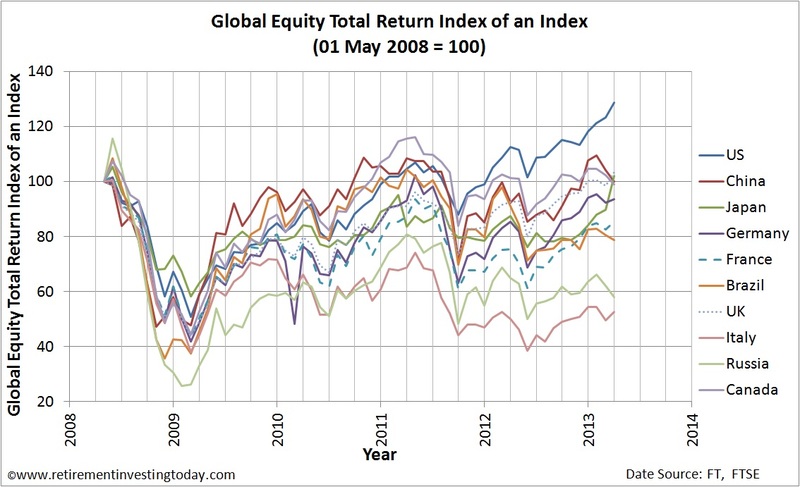 Let’s therefore include them to create a Global Equity Total Return Index of an Index. While the markets of the United States are renowned for fairly derisory dividends (the S&P500 for example today only provides a dividend yield of around 2.1%) it’s not enough to knock the US off the top spot. With dividends reinvested the total return CAGR for the US is 5.2%. Second place is a very tight affair with China having a CAGR of 0.0%, Japan with 0.4%, UK with 0.7% and Canada with -0.2%. Italy remains the laggard with -12.1%. So to answer my question it appears as though it is still sensible to have equity holdings within the traditional developed countries. I’m therefore still satisfied with my strategy with consists of nominal developed market holdings of 54% (including large allocations to the US, UK and Japan) and only 5% allocated to emerging markets. What exposure do you have to developed and emerging equity markets? 2. You are not considering the impact of long term movements in the pound. If the pound falls further over time then my FTSE investments might be worth a bit more in sterling terms due to the earnings derived overseas (assuming the UK doesn't enter terminal decline and markets plummet). But my emerging markets investments would be worth a lot more in pounds, even if the underlying companies didn't do so well. On your first point I very much agree. Past performance is no guide to future performance but unfortunately I don't have a crystal ball so it's all I have. Additionally, data like that used above is very hard to come by and I could only find 5 years worth. I would have liked a lot more but it is just not available today. I intend to now keep updating this data (although I now have so many personal datasets I struggle to keep up) as we go forward which will lengthen the period over time. On your second point. Let me be contrarian to your point. You are not considering the impact of long term movements in the pound. If the pound rises over time then my FTSE investments might be worth a bit less in sterling terms due to the earnings derived overseas. But my emerging markets investments would be worth a lot less in pounds. Only time will tell if the pound will rise or fall. A bit of a fun comparator is the Big Mac Index which suggests that today the £ is 2.7% undervalued against the $. This question is more for passive investors. If you are in Active crowd, such comparison may not be valid that much. Although, it is true that emerging markets underperformed recently with somewhat low valuations. You're of course right. The above analysis does not allow for the skill of some active fund managers but instead is based on the analysis of a series of country indices. I am currently working on a post discussing active vs passive investing which should go live in the next few days. I'd be interested in your thoughts. If you are looking to compare those results with the performance detailed in my post be careful with currencies. I ran the above analysis all in constant $ currency and I believe your examples are priced in £'s. Between the 01 May 2013 and the 26 April 2013 the £ has weakened by about 22% against the $. Interesting article as ever RIT. I think by most standards, the past 5 yrs have not been so typical. Obviuosly the data will vary according to the length of the period under review. Personally, I don't put too much emphasis on percentage weighting to the various global markets - many FTSE companies earn the majority of their profits from many different parts of the world. I always find it interesting to see how the relative size of the various markets have changed over time. I'd say the last 5 years have been interesting but there has also been plenty of interesting times before that. I'm not sure there is ever such a time as typical. Thanks for the Credit Suisse link. Looks like a valuable read that I will undertake when I get some quiet time. Do you know if the yearbook accounts for currency exchange and total return or are they just looking at in country index performance like most of the web research I conducted? I also just want to clarify that I'm always consistent in my approach to these types of posts. I always go back as far in time as I can find the data. In this instance it was 5 years worth. I have therefore not injected any personal bias into the analysis. The numbers are simply what they are. If you looked over 100 years you'd still have your money in the US and UK rather than Italy or the EMs. RIT - have you ever considered using Tobin's q ratio to analyse different markets? I hadn't until the most recent GMO post (http://www.gmo.com/America/). From my initial reading, appears to be a useful indicator for assessing the value of the American market but data seems very limited for other markets - if anyone could point me in the right direction for this I would be grateful. "The Dao of Corporate Finance, Q Ratios, and Stock Market Crashes" is an interesting read at http://www.universa.net/research.html. Yes I have considered Tobin's q. I have however found it difficult to get hold of historical "company net worth" data for each of my indices where the CAPE raw data is fairly easy to find and process now. 1. There needs to be a fundamental against which price can be compared and this fundamental must be relatively stable. 2. The ratio of price to value must not wander all over the place. It must rotate around its average and must be shown to revert to the average, ie to be mean reverting. 3. It must be understandable in terms of economic theory. 4. 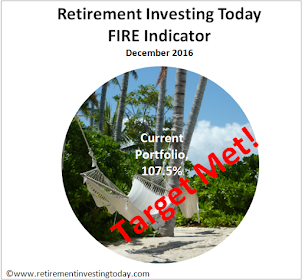 It must have a moderate, but limited, ability to forecast future returns. His conclusion was "...not only did both [CAPE and q] these metrics satisfy all the tests, but they also agree with other..." He then goes on to show a chart from 1900 to 2008 with CAPE and q overlaid on each other. It was enough for me and so I stuck with CAPE. It's a really good read if you believe assets can be valued and financial markets are neither perfectly efficient or pure gambling houses. PS: Definitely not spamming (although the amount of spam I now receive is starting to get to sill levels). Some great thoughts which also keep me thinking. Excellent. Book bought (via your link, so you may be getting a massive percentage of the £2.34 it cost - bring your retirement date forward). £2.34. Great price. I bought it when it was first published in 2009 so paid a lot more than that but even at full price it was worth every penny for me. I'd value your thoughts on it once you've had a read. 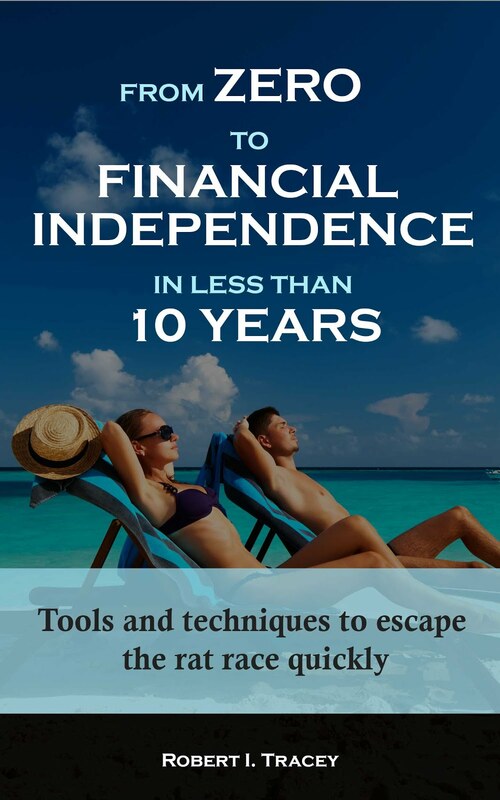 Yes, I do receive a small commission (5%) from Amazon Affiliates if you buy off the link. They charge you no extra though so buying off the link is appreciated. On this topic if you've been lurking for a few months you probably read my post "Blogging for Money". It's a difficult topic for me and one I still haven't figured out. Have you ever considered outsourcing some of your data analysis in the style of the Tim Ferris 4 Hour Work Week? It might reduce the stress in trying to keep up with the various data sets and it may also allow you to do more, have an ever more interesting site, and make more money from referrals! 3. Would the site lose the personal touch it has today.